The Young and the Restless (Y&R) spoilers tease that Ashley (Eileen Davidson) will get updates on a surprising secret. On Monday, Abby (Melissa Ordway) will explain Dina’s (Marla Adams) revelation to her mom. She’ll let Ashley know that Jack (Peter Bergman) may not be a blood Abbott. Ashley will gently point out that Alzheimer’s is messing with Dina’s mind. She’ll suggest that Abby shouldn’t put a lot of stock in any story Dina tells these days. However, Abby will continue to mull this over. She’ll keep interviewing Dina and try to pry more info out of her. Abby just won’t be able to shake the feeling that this secret could be true. Once Dina reveals additional details, even Ashley could get on board the truth train. She’ll wrestle with whether or not she should share anything with Jack. 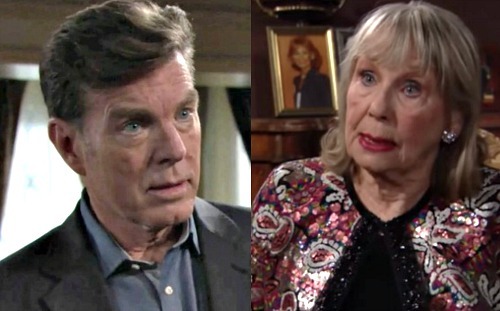 The Young and the Restless spoilers say it’ll be a real dilemma. Y&R fans know that Jack used Ashley’s paternity against her during all the corporate mayhem. He had always assured Ashley that her paternity never mattered, but it certainly seemed to matter when the CEO title was on the line. Jack hurt Ashley deeply and made things worse by helping with Victoria’s (Amelia Heinle) sabotage plot. Ash and Jack’s bond is still broken, so she’d have every right to rub this in. However, that’s just not Ashley’s style. Jack may have been willing to sink that low, but it’d break Ashley’s heart to devastate him with this news. She knows what it’s like to feel like an outsider in her own family and she doesn’t want that for her brother. Besides, Ashley won’t know for sure that it’s true. It seems she’ll just have strong suspicions. Nevertheless, the secret will be spilled one way or another. Perhaps Dina will be the one to blab. The Young and the Restless spoilers say Jack will face a tough blow during the week of April 2-6. He’ll feel like he’s living a nightmare, so it sounds like Dina will reveal that he’s not John’s (Jerry Douglas) son. This could help Jack truly see what Ashley had to go through. It could help them connect on a much deeper level. Of course, The Young and the Restless doesn’t have to stick with this outcome. It’d be nice to keep Jack as a blood Abbott in the end. Maybe Jack could discover that Dina was mistaken after looking into it a bit. Despite earlier evidence that seemed true, Jack could realize it was all in his mother’s head. That’d bring some relief and so would making amends with Ashley. Some good could come out of the confusion. Do you think Dina’s secret is true or just part of her Alzheimer’s? Will Jack and Ashley repair the damage thanks to all this? We’ll keep you posted as other Y&R details emerge. Stay tuned to the CBS soap and don’t forget to check CDL often for the latest Young and the Restless spoilers, updates and news.